Standard Post is only $9.95 AUD per order Australia wide. Express Post available. 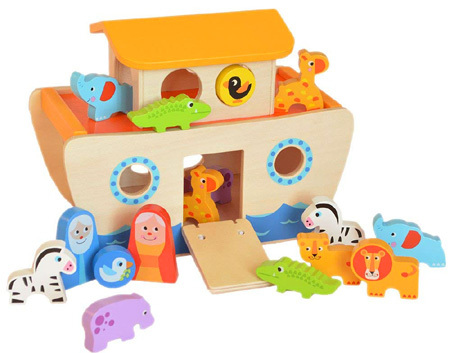 Wooden Noah's Ark Playset is a beautifully made eighteen piece toy depicting Noah his wife and lots of animals two by two. Each animal is part of a pair and each piece can sorted and posted through slots in the ark. This Ark has a fold down rap and the cabin top and deck is removable so all the animals can be placed inside when its time to pack up. This is a fantastic play set..... just be careful the crocodiles don't bite! Size: From bow to stern 26cm height 20cm width 14cm. We like this because: "A wonderful playset great for roleplay and story telling! " Standard Postage is only $9.95 AUD per order Australia wide.